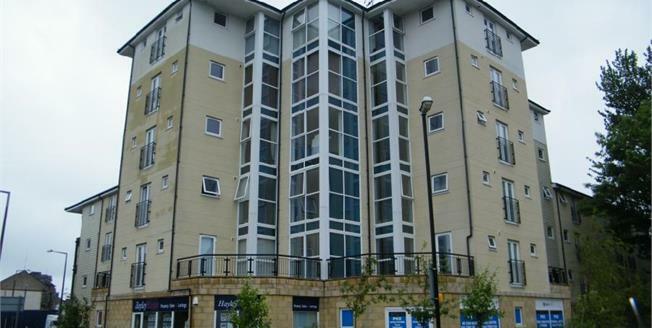 Modern Apartment Offered For Sale In Morecambe Town Centre...Two Bedrooms...Secured Parking..Double Glazed...Modern Open Plan Lounge / Kitchen...Entryphone System...Lift To All Floors...Call 01524 419 554. Entry phone system, double glazed window, power and light, doors to rooms, door to storage cupboard. Hand wash basin, low flush WC, part tiled walls, bath with mixer shower attachment, light, extractor fan, wall light with shaver point, electric heater. Open plan to the kitchen, two double glazed window, power and light, TV and telephone point, double glazed doors leading to juliette balcony, wall heater. Fitted with wall and base units with roll top work surface inset single stainless steel sink with drainer, fitted oven and hob with extractor hood over, double glazed window with views towards Williamson Park, power and light, integrated fridge freezer. Double glazed window, storage heater, power and light, extractor fan. Storage heater, power and light, double glazed window.